In this section we cover the construction and decoration of ceilings in Georgian, Victorian, Edwardian and more modern houses. Ceilings in houses in the UK were normally built with substantial wooden joists with plaster applied to laths ('lathes') or, in more modern buildings, plasterboard nailed to the joists. In houses built before 1939, ceilings were usually constructed from laths, thin wooden slats which were nailed to the joists, coated with plaster which oozed between the laths and which once dry locked the plaster to the laths. Plasterboard was invented in the United States in 1894 by Augustine Sackett. It is a sandwich with a gypsum core between two sheets of cardboard. Plasterboard is found principally in housesbuilt after 1945. 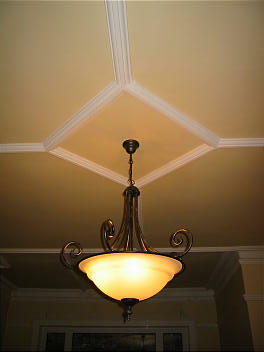 These plain ceilings were then embellished with cornices ('coving') and roses. As with so much decorative detail, the grander the house the more elaborate the styles used, but also as the 19th century passed, so the designs simplified. Roses were generally 'applied' i.e. made separately and then fixed to the ceiling. 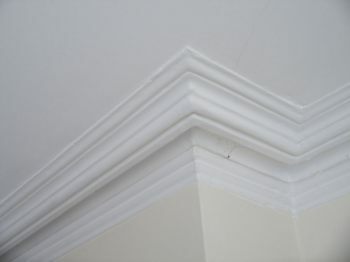 Cornice or coving could be applied, but were also 'run' in situ; wet plaster was put in the area required, and then a shaped blade passed along it removing the surplus and leaving the moulding behind. Some designs may be a mixture of these techniques - for example floral elements applied onto a run cornice. 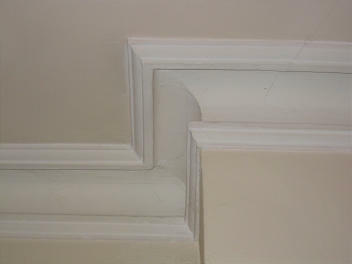 Other mouldings were usually applied; this was a cheaper process. Some late-Victorian and Edwardian ceilings were made from stamped metal but these are rare.